Galganov's Easy Recipe for Pinwheel Cookies! Now let's go make a batch of Chocolate Pinwheel Cookies! Beat fat (butter or margarine) together with the sugar until it is fluffy. Add lightly beaten egg and 3/4 tsp vanilla and beat until smooth. Add flour, baking soda and salt to the wet ingredients and mix until smooth. Divide the dough leaving slightly more than half in the bowl and add in optional citrus elements blending them well. 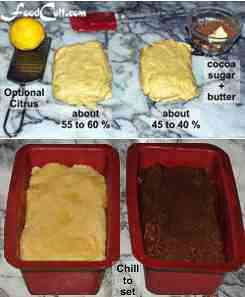 If not adding citrus, skip this addition and remove this portion to the refrigerator to chill for about 1 hour. With the second (slightly smaller than half) portion, add 1 1/2 Tbsp cocoa powder, 1 Tbsp sugar and 1 1/2 tsp (1/2 Tbsp) butter (or fat of choice) and blend until smooth. Remove the chocolate portion of the dough to the refrigerator to harden. Remove the dough from the refrigerator and roll out the non-chocolate part to a rectangle of about 11" (28 cm) x 7 1/2" (19 cm). We like to chill these two flat sheets of dough a little to make them easier to work with but they must not become hard or brittle as they will be impossible to roll. Maybe 5 minutes in the freezer or 15 minutes in the refrigerator. This dough should make approximately 40 cookies. Preheat your oven to 375o f (190o c). Place them on your cookie sheet about 2" (5 cm) apart and bake in a hot oven for 10 minutes. Let cookies set for about 1 to 2 minutes then remove them, very carefully, to a cooling rack. These beautiful, delicate, butter cookies are easily over-baked. If you let them go to golden brown, they've burnt. Remember, this is a gentle, soft cookie. Make them a few times to find out what you like best. For us, 10 minutes in a good gas oven makes perfect Chocolate Pinwheels! The charming, delicate, Chocolate Pinwheel Cookie is a fun to eat variation of a basic sugar cookie. 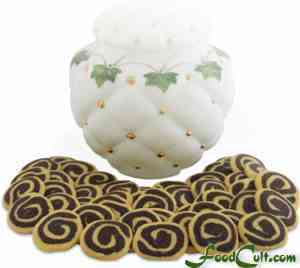 It is usually made as a vanilla-chocolate pinwheel cookie. We, though, prefer citrus in this cookie. That means it is generally either a lemon-chocolate pinwheel or orange-chocolate pinwheel cookie. That does not, by any means, imply that it is never vanilla but we find the citrus-chocolate variation a more interesting and satisfying flavour experience. These pinwheels are refrigerator cookies. Once mixed, the dough is cooled to facilitate forming. It is then cooled, again, until hard enough to cut easily and consistently, with a very sharp knife. We will often use the freezer to cool the dough down quickly. It is usual for us to freeze the dough, in its final form (to assure it stays round during cutting), then move it to the refrigerator overnight and cut and bake them the next day (although a half hour in the freezer, after forming, is generally long enough to ready them for cutting). We like, now, to bake most cookies on a silicon baking sheet. With no need for oil, there is virtually no sticking (and these silicon sheets are great for rolling up cookies as required in making pinwheel cookies).